The road network spreading over Maremma offers an amazing variety of routes. Tarred roads suited to the thin and sensitive tyres of “very special” roadsters, dirt byroads for more versatile bicycles and tracks for bikers looking for wild itineraries through the thick maquis. To the more exacting cyclists the extensive Grosseto province offers cues and occasions of great technical content. Another directrix through this territory is the “Maremma” section of the Ciclopista del Sole, the bike way crossing the Peninsula from Brenner to Sicily in the Eurovelo road network. It is not a bike way in the strict sense of the word but rather a route signalled to the cycling tourists, who want to cross Italy from North to South, looking for a way out of the difficult (for those by bicycle) national road network. The Ciclopista del Sole favours the coastal area and the immediate inland of Maremma developing for about a hundred kilometres. From Follonica it heads to the inland taking a turn in Marina di Grosseto and crossing the provincial capital to reach Magliano in Toscana. 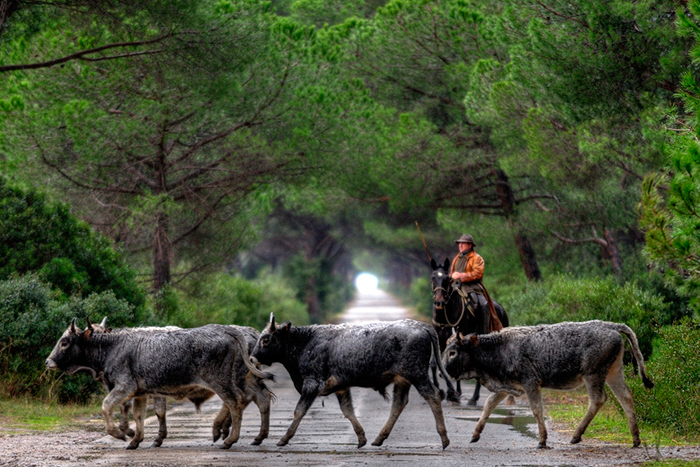 From here there are two possibilities: to ride on to Capalbio or to return to the coast reaching the Orbetello area. The project Bicycle Touring worked out by the Maremma Tourism Board and by the Grosseto Province has its main aim in rendering enticing what the territory has to offer to those who travel and spend their holidays by cycling. This means locating the more interesting routes in Maremma from the touristic and cycling point of view keeping in mind the different types among the cyclists as far as technique (road, hybrid or MTB), skill, level of training and kind of holiday are concerned. The Grand Tour of Maremma is a wonderful cycling tour of about 366 kilometres exploring the heart of Maremma, its countryside, solitary roads, mediaeval towns and sea horizons. It is a directrix suited to each kind of travel: for self-sufficient cycling tourists, for those tourists preferring to take the car for longer travels with the bike in tow to enjoy pedalling lightly along the different area of Maremma, for those cyclists using all-terrain bikes (a few stretches are on dirt roads) or roadsters (variants are planned excluding all dirt roads). The main route, that is the Grand Tour of Maremma, is a real journey to discover all the features of this land, starting from the Metalliferous Hills to the Tuff Area by way of Amiata, from the hills surrounding Manciano to the Costa d’Argento and the Grosseto countryside riding then back by way of the coast to Castiglione della Pescaia and up to the Metalliferous Hills. 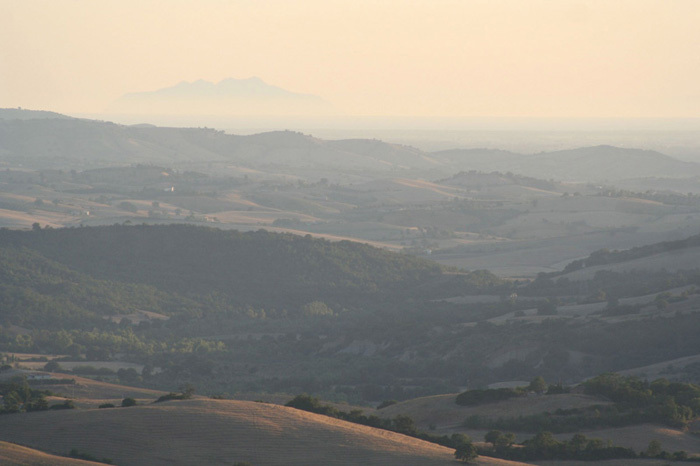 The Metalliferous Hills are the bashful heart of a Maremma that entices those travellers with pioneering instinct looking for new grounds to break. Starting from the stone towns like Montieri and Gerfalco, ancient gateways to Siena and its territories, as far as the historic nobility of Massa Marittima overlooking the blue fringed coast. The strong and true character does not disappear when reaching the Inland Hills surrounding Campagnatico, Cinigiano and Paganico. Stupendous roads, old custom posts as well as the paths, followed by flocks and herds during their seasonal migration, wind through a graceful country, like poetry, genuine like its quality wine Montecucco linking together the Metalliferous Hills, the Amiata spurs and the Grosseto territory. Through its continuity Maremma conveys all its human genuineness by way of its wavy ground, scented with Morellino, that from Scansano rolls down into the Grosseto plain and towards the wide scenery of blue sky and sea, to be seen from Castiglione della Pescaia, to the Maremma Regional Park where a fragile ecosystem coexists with the Butteri’s way of life. Getting back inland the hills grow to mountains. Besides monumental chestnut trees and boundless beech groves, on the slopes of Monte Amiata cling the roots of a Tuscany that is forceful like the ancient extinct volcano and adverse to any standardization. In the shadow of the mountain Maremma writes its own history and misteries in the tuff stone: thousand-yearold tracks, necropolis and towns blend with the volcanic stone carved by time. Hot waters and well-being are the means by which “volcanic” Maremma cuddles legs, bodies and spirits of the travellers and cyclists. Two thrusts on the pedals are enough to bring one back to the seemingly never ending hills and to find oneself once more among pastures and vineyards giving onto Costa d’Argento with its Mediterranean light, distinguished by its peaceful corners, breathtaking landscapes and easy roads for light-hearted cyclists. In addition to the long routes suited to the touring holiday in Maremma there are more than 30 daily round tours covering nearly the whole wide Grosseto province. These are itineraries of varying difficulty, from a level acceptable to families with children and obviously without altitude difficulties as well as with a reduced distance in kilometres, to more demanding routes that satisfy the requirements of cycling tourists and bike lovers looking for proposals that combine the beauty of the landscape with technical contents thus having the chance to tackle the ride with a sporting spirit as well. Some of these itineraries are on tarred roads, others on hybrid roadbeds with stretches of dirt tracks. Therefore the offer is exhaustive and stimulating for those who ride roadsters or all-terrain bikes. And for those bikers who love paths, single tracks and adventurous routes made of dust and mud? Maremma is a real paradise for those keen on MTB with double schock absorbers. The thick maquis, the coastal pine woods and the woods covering the inland hills and the Amiata slopes offer endless routes. Other than the road routes these tours imply a perfect knowledge of the territory, otherwise they can turn into mazes without a way out. On these grounds the best way to explore the “boar” tracks is that of engaging the services of authorized guides and qualified staff, singularly or in groups selected on the basis of their training level and technique.